I hope the photo speaks for itself, but if you are not convinced……For starters, the jam in portion control packets is just plain lazy and the can-whipped cream isn’t much better. The scones, one pumpkin and one date, are microwaved to an inch of their life. If you must order one, just in case it has improved, make the cafe before 3.30pm, lest you’ll be out of luck..or will you? Tea: Standard black or herbal teabag in a pot. Overall: Don’t even consider it! Situated in a converted old church, The Old Bell Tower Café is just as much a gift shop as a café. Chock-a-block full of different styles of giftware and currently, cool Christmas decorations, you can do some shopping after indulging having a bite to eat. Either sit indoors at the jumble of tables in the corner (the rest is the kitchen and shelves of goodies to buy) or in the leafy and flower filled courtyard out the back. Also handy is the carpark out the back that leads straight in to the courtyard. You can order a half or full serve of the lemonade scones, depending on how hungry you are. 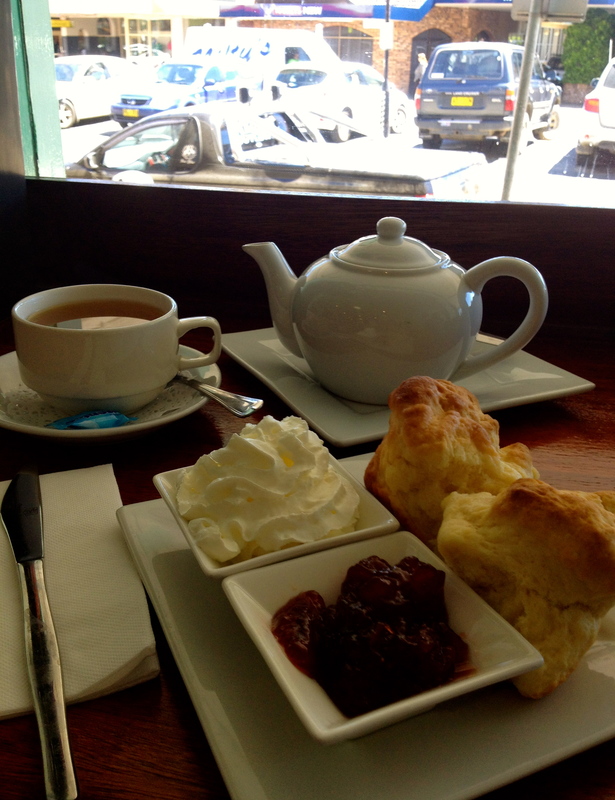 Although the jam and cream are on the ordinary side, the scones are exceptional; tasty, light and fluffy. The website says that they sell ‘old wares’ and ‘antiques’, but to be honest, my partner and I didn’t really see any (we’ve been scouring places for old wares for years). Everything looked new, but that’s not to say that it wasn’t there. If you drop by make sure you have a really good poke around. Tea: A good variety of T2 loose-leaf teas. Overall: A good vibe and a place to pick up a gift or trinket. Quirindi, a quiet country town west of the New England Highway is even quieter on a Sunday morning. But, the most important business in town for me, The Quirindi Coffee Pot, is open for trade. Sitting on the pavement enjoying what little traffic there is, is a tad more interesting than the narrow cafe inside. There are plain and date scones on offer, and you can choose between half or full serves (1 or two scones), which is a great idea if you are after a snack rather than a meal. I go with the date variety, and it is surprisingly good. 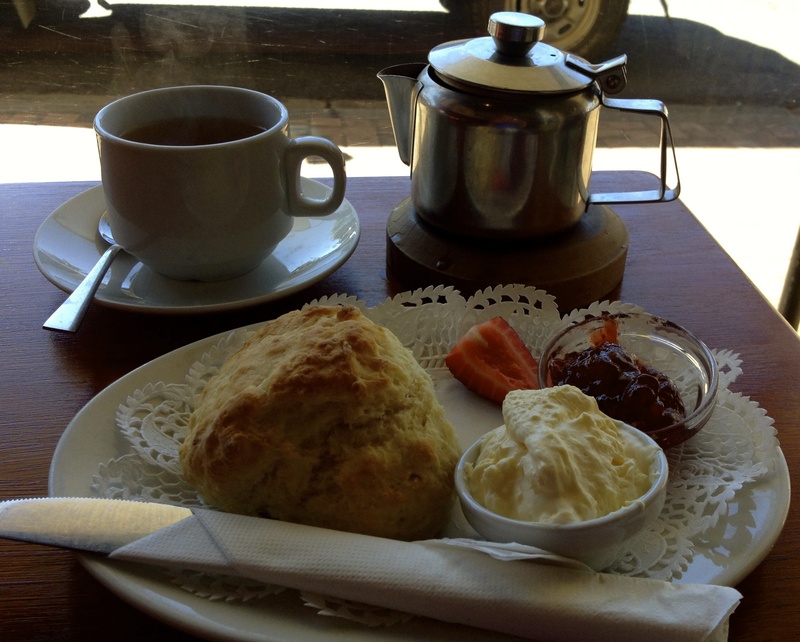 The scones are tasty, with chunks of dates and are fresh and fluffy. It’s so good that I wish I had ordered the full serve. Unfortunately the let down is the packet of jam, and although the cream is freshly whipped it’s pretty light. Love the tea cosy. 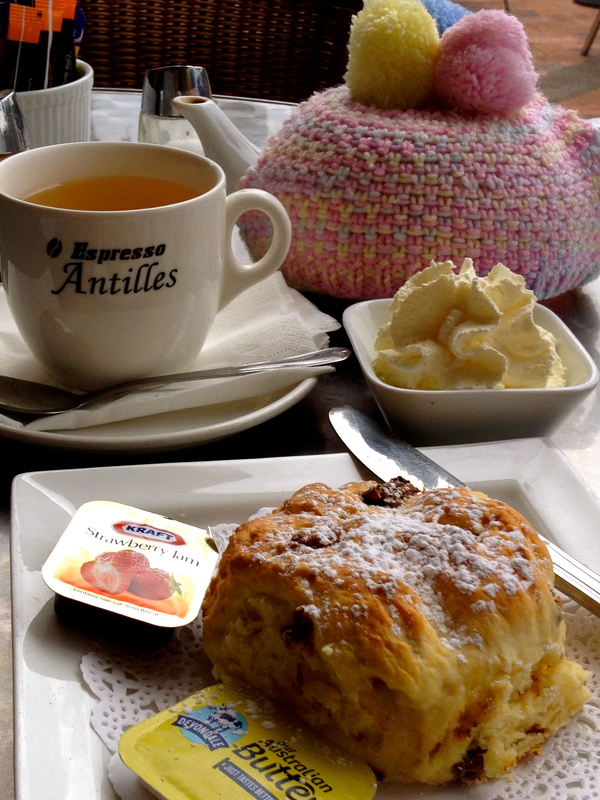 I’ve tried 250 plus Devonshire Teas and this is only the third place that puts tea cosies on their teapots. Daggy for some? Maybe so, but it tops it off beautifully! Be sure to check out the quirky coffee percolators in the window. Tea: A variety of tea served in a big pot with tea cosy to keep it warm. Overall: A worthwhile stop if you are passing through. 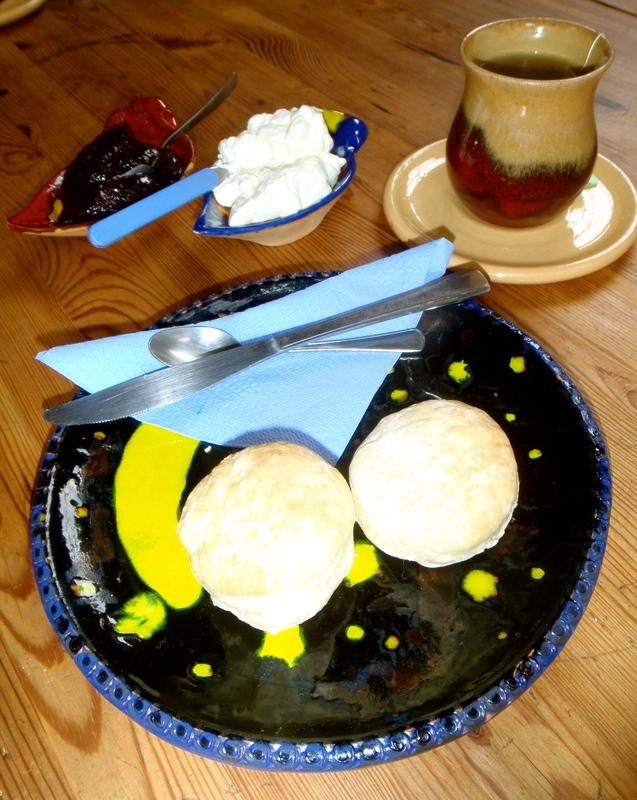 Blue Wren Cafe is located on the organic working farm ‘Barkala’ situated 35 km north of Coonabarabran. They offer accommodation and all manner of farm activities such as horse riding and goat milking as well as the non-farming activities of stargazing and pottery classes. It’s the home of Pillaga Pottery as well, so you can browse the pottery for sale and watch potters at work. The cafe near the pottery studio serves Devonshire Teas, which are all of course served on their colourful onsite-made plates. Sip tea from a funky mug whilst browsing through the pottery. We arrive on a wet and cold day from Coonabarabran, and I don’t think anyone was expecting any visitors. 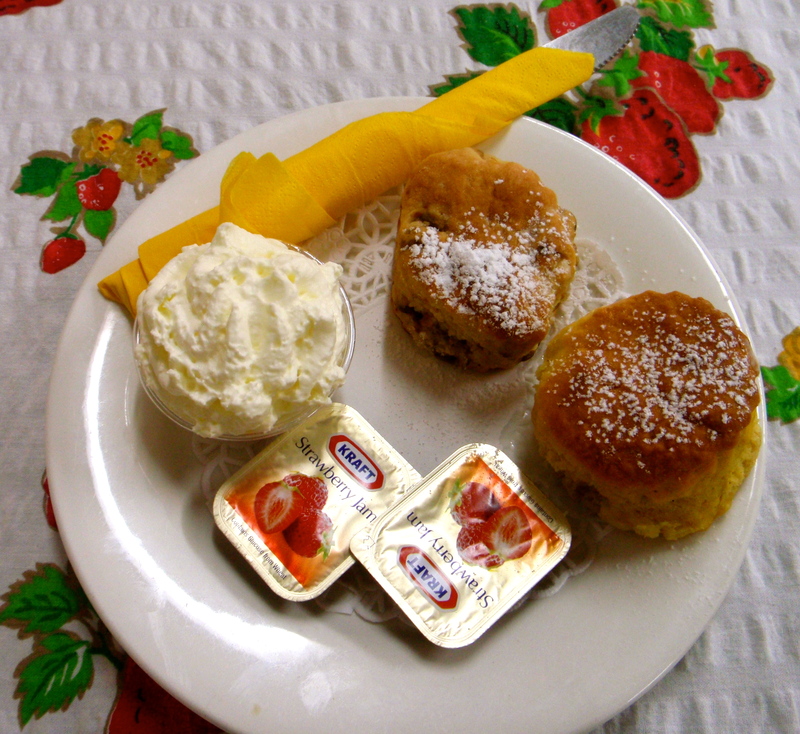 One of the young potters served us, and I have got to say the scones weren’t great – microwaved. 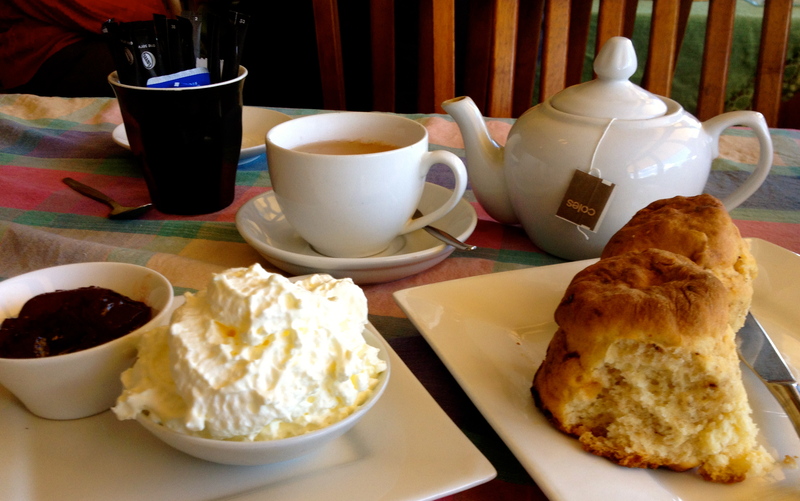 The jam and cream were okay, even acceptable, but you can’t do much with a sub-standard scone. Tea: Teabag in a cup. Overall: A lovely drive in the country. Tenterfield’s School of Arts building marks the spot where in 1889, Sir Henry Parkes made his famed speech that led to the federation of Australia some 12 years later. It’s here you’ll find a small museum on the Father of Australian Federation, a cinema and tucked away behind, Courtyard Cafe. It’s a whole other world out here, quiet, relaxing and the perfect place to grab some sun in the cooler months. There’s a cosy indoor area and an even larger cosy courtyard with country music pumping out of the speakers – but not too loudly. The plain and sultana scones are fresh from the oven; light and crispy on the outside. The cream is thick and cool with a slight sweetness, and the raspberry jam is rich and better than most. 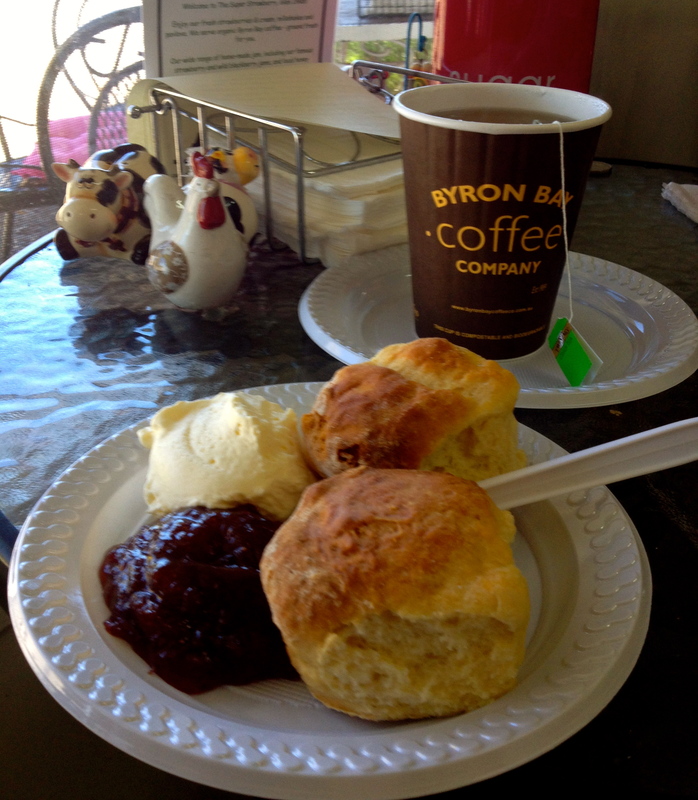 There are several varieties of loose-leaf teas available and for to be different I try the Byron Bay Energy Tea, which is a sweet explosion of berries. The garnish of mint leaf and strawberry makes for a nice finish. Overall: A hidden gem, tucked away in a quiet and sunny courtyard. The first thing I notice as I enter The Coachman Coffee Lounge is the country music playing in the background. It’s probably the norm up here as it’s the second cafe that is tuned in to the same station. I prop myself up at a table that looks straight out on to the main drag of Tenterfield for a bit of people watching. Just as interesting is watching the traffic that’s either heading north to Queensland, south to Sydney or taking the Bruxner Highway to Casino. I hold my breath with the locals as a ‘wide load’; a couple of semi trailers carrying parts of a house squeeze through parked cars and almost taking them along as well. 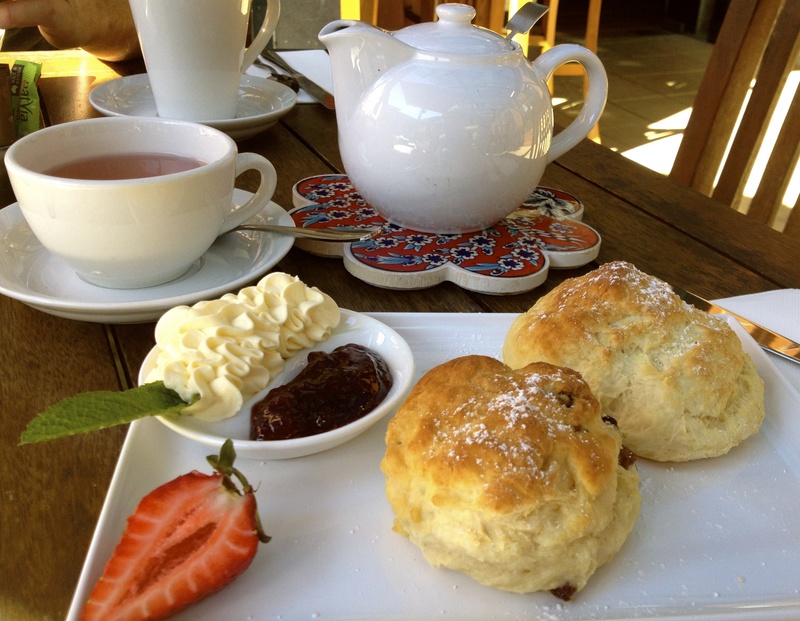 There’s a choice of plain or sultana scones, and half or full serve. I go with the latter on both accounts and am once again impressed with the Devonshire Tea quality in this town. 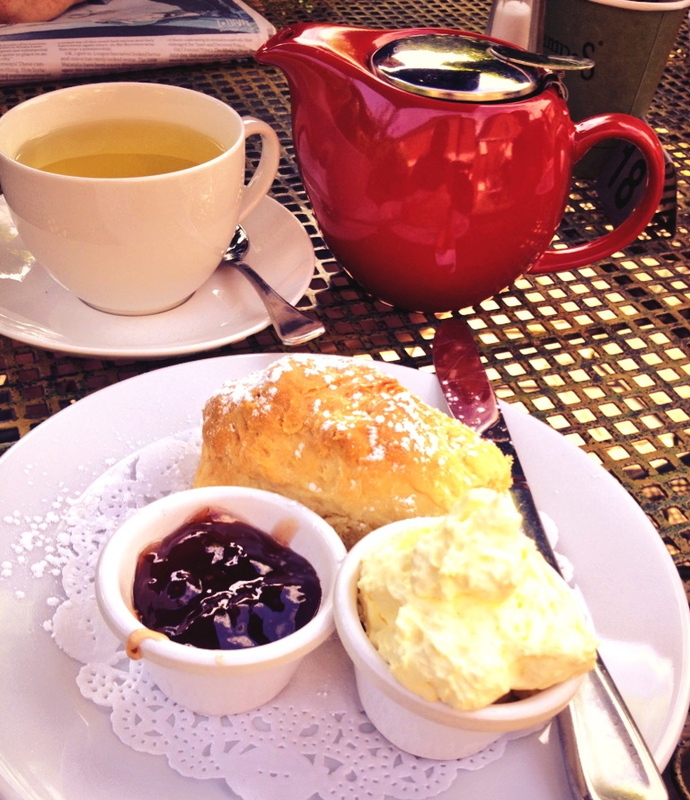 The scone tastes like it’s straight from nanna’s kitchen; crispy on the outside and warm and fluffy on the inside. The cream is thick, perfectly whipped, even my green tea tastes great. The only let down is the average jam. I love the little trivet that comes for my teapot! Tea: Some loose-leaf teas and more tea bag variety available. Overall: A true blue local cafe. Although most of NSW is sweltering and on fire, today the temperature in Guyra is barely hitting 12 degrees. The town is one of the highest in Australia, sitting at 1,330 metres above sea level and boasting the highest caravan park in the country (no doubt a big selling point for the caravan park). To visit the town proper, you have to veer off the New England Highway and head over the railway line, otherwise it’s a blink and miss type of place, especially if you are on a mission heading north or south. There are quite a few cafes, but I stick with the first one I see. It’s quite an eccentric place. The decor is a mish mash of rubber thongs and shoes, sunglasses, jams, soaps and knitted babies clothes. Do babies still wear knitted clothes? The owner is chatting loudly with a group of ladies and when they leave he makes a beeline for us, telling us about his extensive car collection. I wonder how he ended up running this shop in Guyra? The scones arrive looking rather over microwaved. We’re told they are made from quinoa, wholemeal flour, chai, sultanas and something else. It sounds unappealing but it actually works. Not great, but interesting. The cream is a bit sweet and very light, and tastes like it’s out of a can. Although interesting jams are for sale, unfortunately they aren’t used in the Devonshire Tea. Tea: A few varieties of inexpensive teabags served in a good-sized pot. From the outside, Peppermints in downtown Glen Innes looks rather cool and I expect an ice cream parlour with booths inside. Instead it’s a cafe with a pretty paint job on the outside and an even prettier name. I prop myself up at the bar at the window so I can people watch. An old farmer pulls out with a cattle dog tied to the back of his Ute, just as a souped up Holden Ute sporting a shiny set of hunting lights and an even brasher number plate pulls up out front – I am surprised to see a woman step out from behind the wheel. Meanwhile my scones arrive looking pretty good. They taste a little over microwaved and chewy, but have potential. The jam is average and the cream is very light and airy like it’s out of a can. I must say I do enjoy the loose-leaf tea which sometimes is few and far between. Tea: A small variety of loose-leaf teas served in a good-sized pot. Overall: An ordinary cafe with a cool name. If you are arriving in Glen Innes from the south, its hard not to miss the giant Super Strawberry sign on the right hand side of the New England Highway. The little cafe/giftshop sells all things strawberry and then some. The trays of fresh strawberries laid out on the counter smell wonderful and make you want to buy kilos of them. If you’re in the market for some jam, there are shelves of them plus chocolates, free-range eggs and trinkety giftware. Sit inside in the cosy cafe or outside under the trees in warmer weather, or do takeaway. I’m a little disappointed when my Devonshire Tea arrives. The plastic plate and knife, and the paper takeaway cup is a dead giveaway that visitors drop in and stay just as long as it takes to pick up strawberry supplies. A shame for those who want a more permanent experience, as the cream and jam are top-notch. They are so good that I could happily just eat the two mixed together. The scones are better than average but with more inferior jam and cream the slightly over-microwaved flavour would be more evident. Tea: A small variety of teabags served in a large takeaway paper cup. Overall: A handy stop to pick up super fresh strawberries.